Thank you to everyone who has supported our fundraising campaign for the Syrian family in Blueridge who suffered a burglary in early June. More than 60 people donated (online, via the school, or in person). 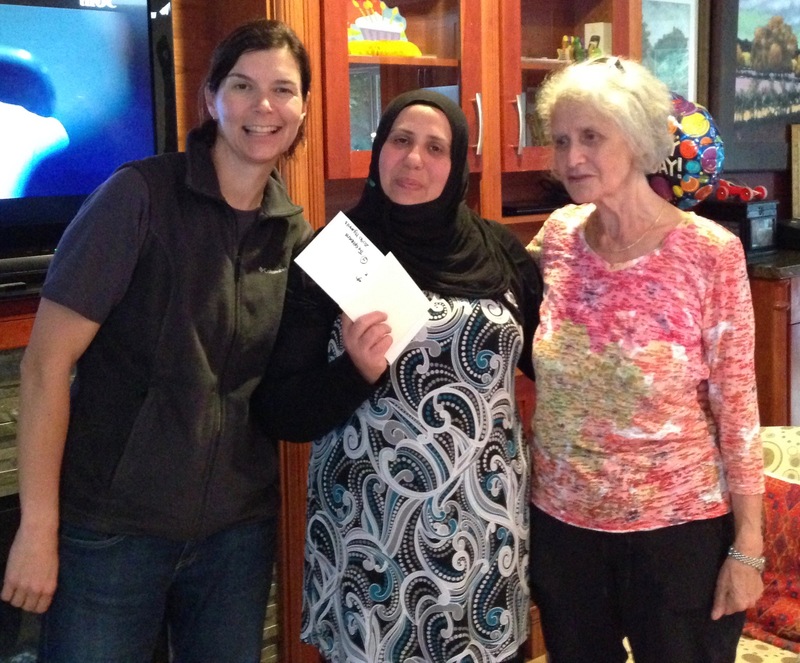 On Tuesday evening, Anni Danielson and Angela Duso of the Blueridge Community Association, along with Wafaa Masri (who has been so helpful to the family as both a friend and an interpreter) stopped by to drop of the cheque and well wishes from everyone in Blueridge. We had a lovely time and enjoyed their hospitality very much. Said and Honada are busy learning English so we were able to try out a few words (a raccoon family was ambling down the street during our visit which made for some excitement). The kids were excited for the final few days of school (along with Sports Day which is happening today). The family was so grateful for everything. They have received support from the community, the school, and their neighbours. They said that they won’t let what happened influence how they feel about Canada, and that they are so fortunate to have been able to come here. To find out more about the family, please visit the blog that their excellent sponsor organization (REST) is updating regularly. This group is working tirelessly to bring families like Honada’s to Canada and support them for their first year (no small task!!). If you’d like to help REST in their efforts please contact Shannon Muir of REST by email.